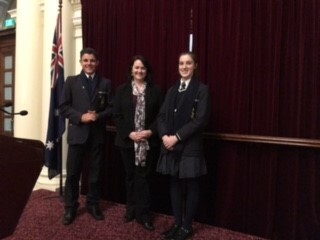 On Tuesday 24 May, I accompanied our two School Captains, Genevieve Barclay and Michael D’Addazio, to an annual School Captains’ function which is sponsored by members of Victoria’s Parliament who serve the Eastern Metropolitan Region. This event provides an opportunity for senior student leaders to meet some of our state politicians, to tour Victoria’s wonderful historic Parliament House and to hopefully have the chance to see at least one of the Houses of State Parliament in session. The three principal hosts for the evening were: Bruce Atkinson and Mary Woolridge, each a Member of Victoria’s Legislative Council (The Upper House) and Dee Ryall who is the local member for the seat of Ringwood in the Legislative Assembly (Lower House) – Tintern Grammar is in the Ringwood electorate. The Hon Mary Wooldridge is the Opposition leader in the Legislative Council and Shadow Minister for Health. The Hon Bruce Atkinson is President of the Legislative Council. He always takes a special interest in the Tintern Grammar Captains as his two daughters and son are Tintern Grammar graduates. As our School Captains Genevieve and Michael and attendees from other schools are seen as potential future leaders and problem solvers for both our State and our Nation. During the evening Dee Ryall showed us around both Chambers of Parliament House as well as the fabulously ornate Library which serves all members of Parliament, as well as Queens Hall. Dee Ryall was able to provide us with many “snippets” from the History of our State Parliament and we were able to see the Legislative Council in session and to observe parliamentary debate on a current issue. Early in the evening, Genevieve and Michael were able to chat further with Heidi Victoria about their career aspirations. Heidi Victoria is responsible for the ministerial portfolios of Arts, Women’s Affairs and Consumer Affairs within the Victorian Liberal government and is the Legislative Assembly member for the Bayswater electorate. She has visited Tintern Grammar many times to address School Assemblies and is herself a current Tintern Grammar parent. As all families and students would be aware we have now officially entered the Winter season for School Uniform and thus, apart from “free dress” days and days when particular year groups may wear Full Sports Uniform, Winter uniform is required every day, including to all examinations. The GAT – Tuesday 7 June. 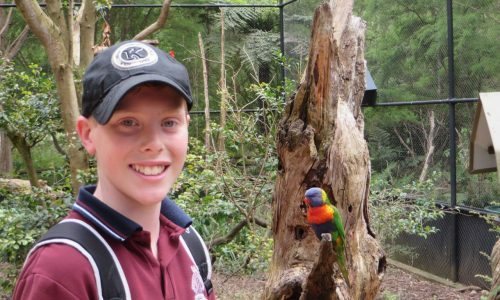 All Year 12 students and all Year 11 VCE students who are completing a Unit 3/4 subject this year will be sitting the GAT (General Achievement Test) – a state-wide 3 hour test of general knowledge and skills which runs from 10am to 1:15pm and is scheduled for next Tuesday 7 June. Hence for these students there will be no Periods 1 – 3 classes on this day. Year 11 IB students will have their usual Periods 1 – 3 classes; Year 11 VCE students who are not completing a Unit 3/4 subject this year will also be expected to attend classes in Periods 1 – 3. As this is a year when the GAT falls on a Tuesday we will have our usual scheduled classes in Period 4 and Period 5 (late class) on this day and all students are required to attend their scheduled classes. Students undertaking the GAT are required to meet Mr Andrew Cho (VCE and VET Co-ordinator) in the Anderson Centre at 9.00am on the day to check the seating plan and to allow sufficient time for staff to organise the 138 students who will be sitting the GAT in accordance with VCAA regulations.